Ever notice how you look at a room in a magazine or a show home and want to recreate it – but no matter how hard you try it never quite looks the same? That’s because those pictures are done for the camera to accentuate space – and are not how we all live. They don’t have any real life “stuff” lying about, the kind of items we all live with, but that can be visual clutter all to easily. A great way to decrease the look of this clutter in your home (after actually decluttering that is!) is to make smart buying decisions when it comes to the furniture and items you have around the home. Multi-functional furniture is a great way of doing this, and having hidden storage in some of your most used pieces can create a clutter free feel to your home instantly. It really is a quick win because you get to keep everything you need to hand in the right place/room, but you don’t have to see it every time you walk in. Think about it, no more magazines lying around the living room, they are in there but hidden away – no more bulky bedding for occasional guests, it is in the sofa bed already! 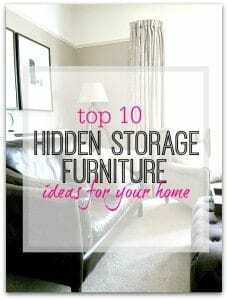 I could go on – but here’s my top list of favourite hidden storage furniture solutions that may give you some inspiration for your own home. A footstool with storage ** means that you get maximum functionality for the space. You get a seat, a footstool(!) AND storage. TIP – I like using a footstool as an alternative for a coffee table in the middle of the room with a tray on top to house cups etc…. Also, if you have kids in the house it’s a great alternative to a standard coffee table as it has a lot less sharp corners, and can easily be moved out of the way when playing. A sofa bed is a multi functional piece of furniture anyway, but if you can get one with added storage as well then it’s a huge bonus. The one pictured if called Bari from Made.com – but there are a variety available on their site ** and others so have a look around for the right size and shape for your space and needs. The storage is an ideal place to keep all the bedding a guest would need ready to go at a moments notice. Great for unexpected guests – and if it’s late when they come round you don’t have to wake anyone by rummaging around to look for blankets, pillows etc…..! I particularly like this one as you can’t tell its anything other than a sofa when you look at it – so feels very sleek and streamlined. I love to use benches for seating at dining tables, because they are much more streamlined in the room (especially a kitchen/diner). One of my all time favourite hidden storage ideas, as they can totally change your bedroom into a very uncluttered space because they hide away so much!. I love the way that the bed, which is the biggest item of furniture in a bedroom by far, can create so much hidden storage ** so easily – and there are so many varieties of storage bed out there. The one pictured is in my Guest bedroom and is perfect for housing spare bedding, and also all my wrapping paper and gifts (as I use this room for all my gift and card storage). I was at the Northern Home Show a couple of years ago with the House Doctor Network and saw the most amazing piece of furniture there – a study bed. Basically it’s a desk that transforms into a bed in just a few seconds. The beauty of this is that you don’t need to tidy away what’s on your desk at all because everything stays put for the next time you need a desk again. Perfect for teenagers rooms where they need lots of working space, or in a guest bedroom that doubles up as an office – so that the work area can be totally hidden away when not needed – creating a calmer bedroom. Take a look and see what you think! 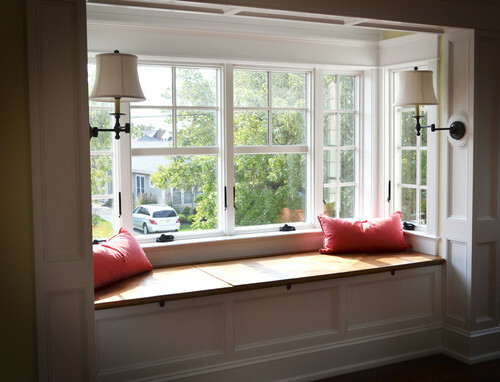 If you have a bay window (or it can even work along one wall of a room if it’s big enough), you can maximise the space by having a window seat. Added seating, a feature for the room AND hidden storage – what could be better! Here are a couple of pictures to give you some inspiration – a local joiner/carpenter could make one to fit your space. I love items that have two purposes, and as such when I came across this one from Amazon** I had to share! Not only does it look great, but it also keeps all your jewellery to hand but out of the way – it looks like a normal free standing mirror but opened up houses so much. As with a bed, a dining table can take up a lot of floor space without giving much back in terms of storage. Its bulky and has only one purpose – to create a flat surface for eating/working etc…. I’ve already talked about using benches to add extra storage to that area, but why not go one step further and add storage to the actual table as well? Having drawers in the table** means that you can easily create storage space for cutlery, linens, place mats etc… all to hand where you actually need it. Or why not use them for pens and stationery if you tend to work at the table (a sort of hidden home office!) – a great idea as well for children to have things on hand when they do their homework. I love this idea for a pull down desk, as it creates a home office in even the tightest of spaces. This** would be perfect for a kitchen, so that it can be pulled down when needed and pushed away when not in use – clearing floor space but still allowing for items to be stored ready to go. This is a fantastic item of furniture for your hallway or utility room as you have a bench seat to enable you to sit and put your shoes on easily, a cupboard for your shoes, but also there is a hidden storage area under the seat itself – perfect for your handbag/keys etc…. so you can grab as you walk out of the door. The way they are slightly hidden away is great as this adds a little security to your things. It’s always worth looking for hidden storage furniture solutions for your home because furniture takes up a large part of a room and should therefore work hard for you. If you can hide away your things within the furniture you need, then naturally your home will become more streamlined, and you should be able to store things right where you really need them, which will save you time and effort as well. It really is a win-win all round! 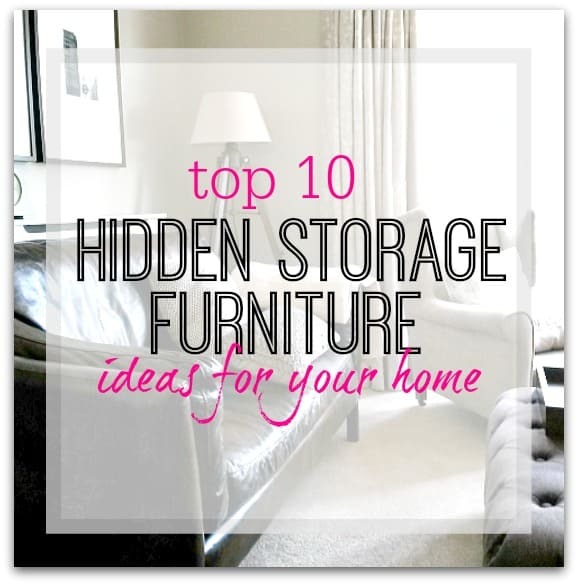 Do you have any hidden storage furniture in your home? I’d love to know what works for you, so please leave a comment below – thanks in advance! I do think those Study Beds are a fantastic idea. Do you know if they make them in double beds, or are they just for singles? Hi Emma – The study beds are available in single and double – so will work for loads of different needs – thanks for your reply!